The porch gates are on the south side of the nave. If they were originally accompanied by a plaque it is now lost. No transcript of a plaque has survived, if indeed one ever existed. 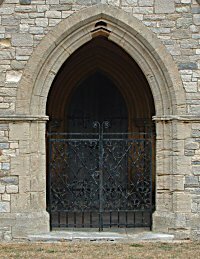 The only document which mentions the dedication of the gates to the Old Wykehamists is a presentation leaflet celebrating the restoration of the church which was probably published around 1874. If this date is correct then it would explain why Archdeacon Wright did not include it in the History of the Domus Dei which was published in 1873. 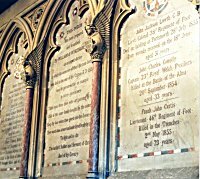 There is a memorial to the Old Wykehamists in the chapel at Winchester College from which is taken the text below.